As a new business owner, it’s exciting to imagine the day your big dreams come to fruition. But you’ll need to have some specific systems in place to get there. One of the most important aspects of running a business — whether in the startup phase or after many years of operation — is sales forecasting. To put it simply, sales forecasting is the process of predicting what a company’s future income will be during a certain time period. Sales forecasting affects every other area of your business, including how many people you will hire and long-term relationships with investors. A big part of sales forecasting is looking at past revenue and expenditures during similar periods. But sales forecasting can be tricky, especially when you don’t have an established sales history. Once your business is growing at a comfortable and sustainable pace, you can adjust strategies accordingly and focus more on reducing expenditures and increasing profitability in specific areas. You’ll also need to stay abreast of changes and trends in your industry. To use Tabbush’s boot example: Are analysts predicting a shortage in the raw materials needed to make those shoes? Are there economic factors affecting your target market’s disposable income? These would be factors to consider when creating your sales forecast. You may need more frequent sales forecasts during the startup phase, since you won’t have a sales history on which to base predictions. (It’s also common to have more frequent forecasts during financially challenging periods, and conversely, when your company is experiencing rapid growth.) Once your business is stable and more established, you can move to quarterly or yearly sales forecasts. Office space: You’ll need somewhere to do business and a physical space to meet clients. Make sure to consider any building upgrades or improvements that may be needed to accommodate your specific business. Many office spaces may need upgraded wiring and more outlets, for example. Be sure to factor in the cost of cleaning and maintaining your space. Equipment and supplies: What will you need for your business to operate smoothly and efficiently? Most businesses will need a computer, software, furniture, filing cabinets, phone lines and printers. You’ll also need to factor in the cost of office supplies such as printer paper, paper clips, folders, pens and whatever else you’ll need to stay organized. The cost of these smaller items may not seem like much, but they can add up. Utilities: Once you secure your space, you’ll need to figure out your expenses for things like electricity, telephone lines, internet, water and garbage service. Remember that some utility services require a deposit. Inventory: If you are opening a retail business, you’ll need initial inventory. If your business is manufacturing, shop around and compare prices on raw materials. Advertising: You’ll need to promote your business heavily in the startup phase. Consider the costs of print and digital advertising, samples, trade shows, brochures, business cards and specific marketing campaigns. And of course, you’ll need a fantastic logo and a user-friendly, search engine optimized website. Licenses and permits: Small businesses are subject to local, state and federal regulations and fees. Do your research. Attorneys and accountants: Attempting to figure out complex legal and tax matters yourself can be disastrous. Invest in a professional. Employee salaries: Remember, this is your dream, not your employees’ dream. They need to be paid — on time — regardless of whether sales are slow or not. So how do you balance big dreams with realistic expectations in sales forecasting? To create an accurate set of growth projections, Tabbush advises analyzing the competition. Perhaps the most important aspect of having an accurate sales forecast is so potential investors can see you have a clear plan for growth. “You need to provide guidance, history and show existing activity that will predict how your revenue will be generated if you want additional investor partners to help scale your business,” Moats said. 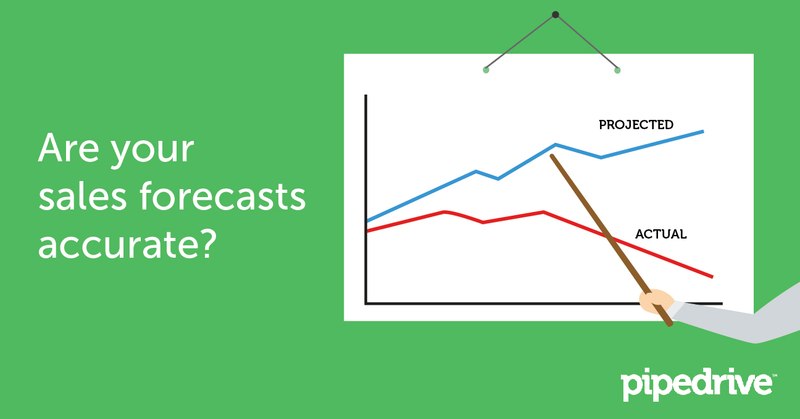 Do you have other tips for creating sales forecasts? Let us know in the comments below.